traditionally underrepresented in higher education. Are you a Magis-profile student or family? Email the Magis Director of Equity and Inclusion to receive more information about the Magis High School Support Programs! Magis provides opportunities for participants to find success during their time at St. Ignatius and ultimately in their higher education pursuits. The Magis Office is a safe space for all, irrespective of difference. We provide students with a variety of resources and experiences that support their social-cultural development, including but not limited to: Magis Film Days, the Arrupe Textbook Exchange Program, Community Building Activities, Workshops, Conferences and Presentations on topics that impact their experience at SI. The Magis College Advising Program provides support to participants in their preparation for college entrance. In addition to their SI college counselor, Magis students are able to work closely with our Magis College Advisor, Mrs. Anna Maria Vaccaro. The overall objective for all grade levels is for them to know a college education is achievable, affordable, and attainable. Magis-profile students are presented with weekly workshops that focus on college and career exploration, enrichment programs and scholarship opportunities such as the Magis Summer College Bootcamp that provide a roadmap to understanding the financial aid and college application process. Students also have the opportunity to visit local colleges and universities. 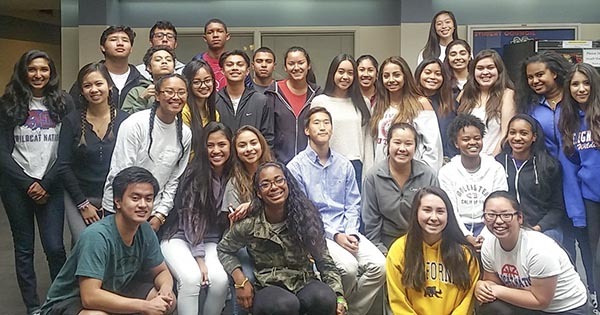 In addition, during their Sophomore or Junior year, they are invited to participate in a four-day Southern California college tour. Six-week SAT Prep courses are offered to sophomores and juniors in the fall and spring. Limited spots are available. More information coming soon. Magis students are able to use the Magis Center to study, complete assignments and projects, and seek academic support. Each year, an SI Alumni Volunteer serves the Magis Center as an academic tutor, mentor, and advocate who works with our students one-on-one. Students who fall under a certain GPA are contacted by the Magis Academic Support Coordinators to create and sustain an improvement plan. Magis students are encouraged to take advantage of the resources that are available daily in the office. The office is open from 8:00 am to 4:30 pm Monday through Thursday and 9:20 am - 3:30 pm on Friday and is staffed by one of the Magis Center Staff. In September the Magis Center will be offering after school academic support for students seeking a place to do homework and tutoring from peer tutors, teachers, and Magis Center Staff. Oct. 17-20: Magis Southern California College Tour - 10th and 11th grade Magis students encouraged to apply; more details to be announced. Please remind your Magis students to take advantage of additional support on Day I and Day II (1st - 30 minutes of every resource period) during drop in times for Magis College Advising with Mrs. Vaccaro! Magis Southern California College Tour October 17-20, 2018! On this tour we will be visiting an array of colleges and programs such as UC Santa Barbara, Loyola Marymount University, USC, UCSD, SDSU, and more. We will also visit The Museum of Tolerance. Please follow us on Twitter or Instagram. Magis weekly meetings are BACK! October 10, 2018 is a big day for everyone! Sophomores and Juniors are gearing up on taking their PSAT exams. So remember confidence is a key in achieving your dreams. Check out this video. Quarter Break: October 17-21, 2018. Seniors this is a great time to visit campuses in person. If you can't get out of the Bay Area, consider visiting a small campus (Dominican, Notre Dame de Namur, Holy Names University), medium campus (Santa Clara, St. Mary's, Sonoma, CSU East Bay, USF, Stanford, CSU Stanislaus) and a large campus (UC Berkeley, UC Santa Cruz, San Jose State, San Francisco State). Go to the campus website and put in "visit" on the search menu to find how to schedule a tour and admission presentation. Feel free to go to their Student Union and have lunch or sit in a large lecture class especially at the public campus to get the vibe of a campus. This is a supplemental workshop to help our Magis Senior families jump start their college financial aid workshops in addition to SI's workshop on October 26th from 6:30 to 9 p.m. The goal for this workshop is to provide an overview of all types of financial aid and help families to fill out the FAFSA form on siteBring the following:Student's FSA IDOne Parent's FSA ID. Bring asset information (amounts of savings, investment funds and other related accounts). Bring income information Know your social security number of the student and the parent filing. Know your college list that you are submitting the forms with. Bring a copy of your 1040 from from the 2017 filing year. Try to come together (one parent and one student). This NOT required but it helps the process. SOPHOMORES/JUNIORS: Don't forget to take 20 minutes a day to prepare for the PSAT test via Khan Academy. Juniors: remember how to link your old PSAT to get a customized study guide? Did you forget? Then look here. Sophomores: Here are more resources — www.satpractice.org.